Shopping…you either hate it or love it. Me? Well, if you know me at all, you know I love it, and probably a bit too much. What makes it worse is that I typically have fairly expensive taste, but can’t ALWAYS splurge on those designer shoes or bags. So this week, I challenged myself…by shopping ONLY at Target! On Wednesday after work, I bolted to the closest Target to me. Somehow there just aren’t that many in the valley, which is a huge bummer. Anyway, I already had in mind a few things I wanted to try on. There are two brands that I absolutely love , WhoWhatWear and Victoria Beckham’s line. Yes, I know they are more designer brand, BUT everything in their collections are beyond affordable. After diving into each rack with my eyes peeled, I finally found a few things I really loved, plus other pieces outside of the ‘brand section’. I found the denim skirt featured in these photos, two tops, a dress, a belt, and two pairs of shoes…all for $170!!! If that doesn’t qualify me as a fashion budget queen, I don’t know what does! For today’s look, I paired this Mossimo Denim Skirt with a vintage graphic tee (also from Target), my cropped, white Curated x LTS denim jacket, white Topshop sneakers, and a pair of Nordstrom sunnies. Now, I may have cheated a little with the jacket and sneakers, but in my defense, the sneakers were on clearance when I got them from Nordstrom Rack! The jacket is a bit costly, but it’s one piece I’ve had for a while now and get a ton of use. Also, when I say a vintage Target tee, I mean I’ve legitimately had this shirt for going on 10 years now. Anyway, I’m sure you’re wondering how much this all cost? Ladies and gentleman, drum role please….the total for this outfit (minus the jacket) was….$40! How did I do it? Now see guys, just because you may have champagne taste with a boxed wine budget, doesn’t mean you have to live in sweats or what have you. You can still dress to the nines and I can assure you that you will receive just as many compliments on your Target ensemble as you would all designer pieces. I mean, Anna Wintour would know the difference, but who’s really running into her on the reg? I’ve linked some of my favorite denim skirts from other brands below…some steep, some a steal. 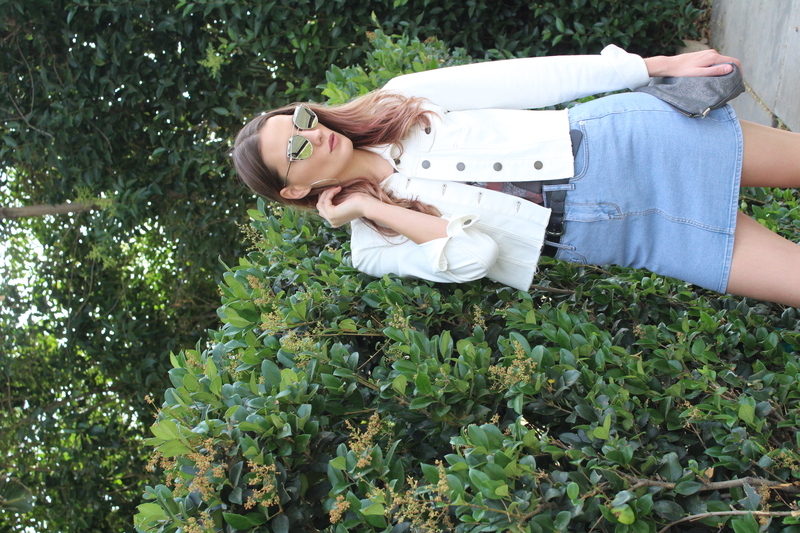 Keep your eyes peeled for my next TargetStyle finds! Until then…stay golden! Great casual look. You and I have the same budget mindset. I try to shop mostly sale items but occasionally if you find something thats a bit more, but you know it’s good quality and you’ll definitely get use out of it…go for it!! loving all these denim skirts! it’s like bringing the 90’s back. obsessed with those ground zero ones! too bad it’s sold out. Thanks girl! I may be a late 80’s baby, but I’m totally a 90’s lover <3 And I totally agree on the Ground Zero skirts! Oh I’m so happy denim skirts are back in! Haha I love the “champagne taste with a boxed wine budget” quote. So true! haha I love this, I totally have champagne taste on a boxed wine budget!! hahaha. anyways, target has done amazing at keeping up with trends and I’ve been pleasantly surprised at a few pieces I’ve found there recently. Absolutely love this denim skirt!! Wowwww these denim so beautiful. Love it.